I've been wanting to try chia pudding for so long now - I think I've had this mango coconut chia pudding bookmarked for two years - but for some reason I've never gotten around to it. Lately I've been craving dessert much more, likely because the days feel longer, I've been staying up later, and thus need more food to sustain me, so I've been trying to find healthy desserts that still satisfy a craving. 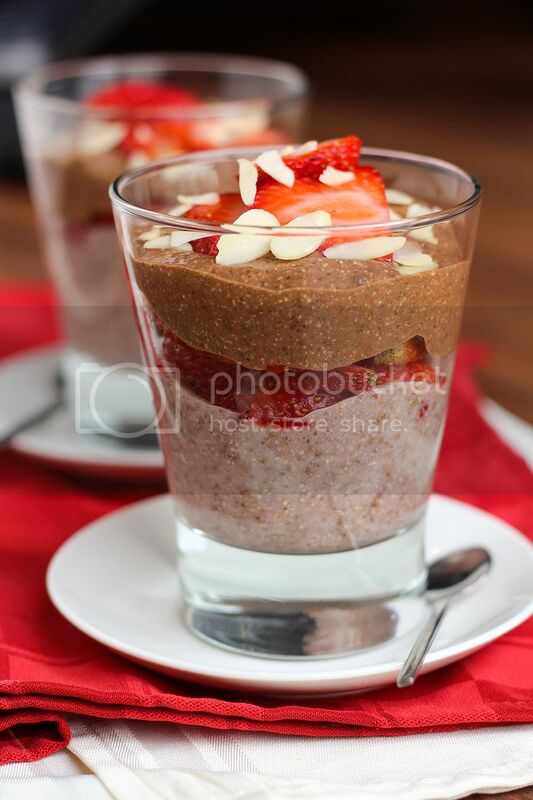 So when I saw Dietitian Debbie's beautiful layered chocolate and strawberry chia pudding recently I decided to give it a try! I feel like chia seeds are everywhere lately, but if you haven't heard of this little superfood before, it's basically a tiny seed that's packed with nutrition, including lots of fiber, omega-3 fatty acids, calcium, other vitamins, minerals, and antioxidantst, and even protein! And because they can absorb somewhere around 10-12 times their weight (I've seen various numbers floating around) and take on a sort of gel-like consistency when they do so, they're great for making healthy pudding (though of course, you can use them in many other ways, too)! The version I came up with is different than the original idea, but this pudding is still really easy to make. 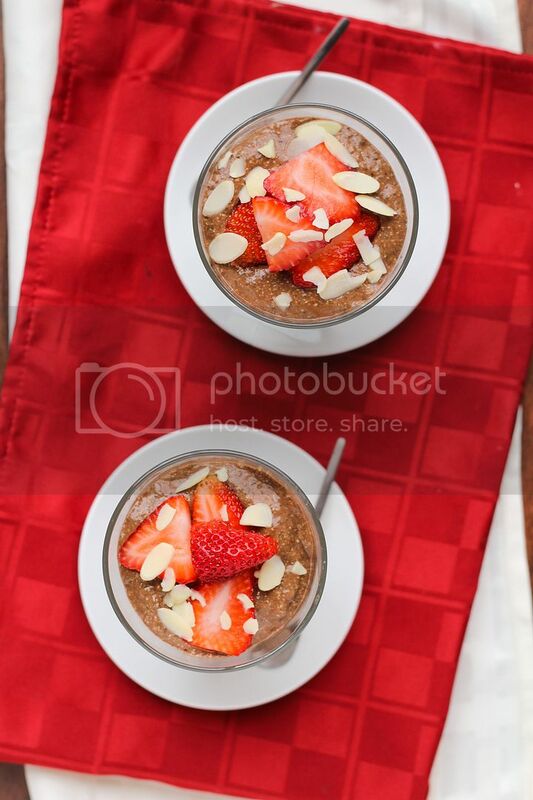 Both the chocolate and strawberry portions contain unsweetened vanilla almond milk, chia seeds, and pure maple syrup for sweetener, then the chocolate version has added cocoa powder while the strawberry version contains fresh strawberries and a little vanilla extract. I also used Oh My Veggies' idea to blend the chia pudding after to give it a smoother texture, but you can leave out this step if you like. I topped mine with more strawberries and sliced almonds for crunch, but you could use chocolate chips, coconut flakes, or anything else you like! The only difficult part about this recipe is waiting for the pudding to set. It's best to leave it overnight, but otherwise plan for at least 4-6 hours to let the chia seeds work their magic and turn this into pudding! This makes a perfect light summer treat that satisfies a dessert craving but leaves you feeling good, and it would also totally be appropriate for breakfast! Ryan was skeptical about the whole idea but after trying it, he said he could eat it every day, so I'd say it was a big success! 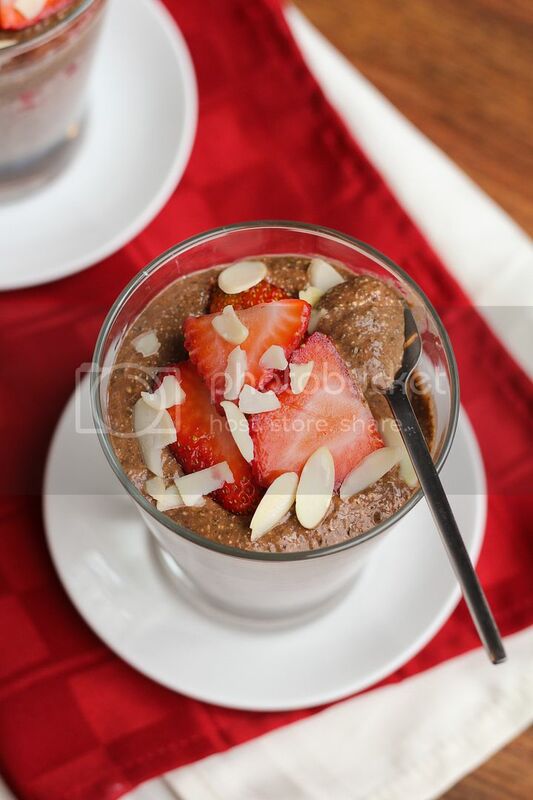 To prepare strawberry pudding, blend almond milk and strawberries in a blender until smooth. Transfer to a bowl or container and stir in chia seeds, maple syrup, and vanilla until well combined. Cover and keep in refrigerator overnight or until set, at least 4 hours. 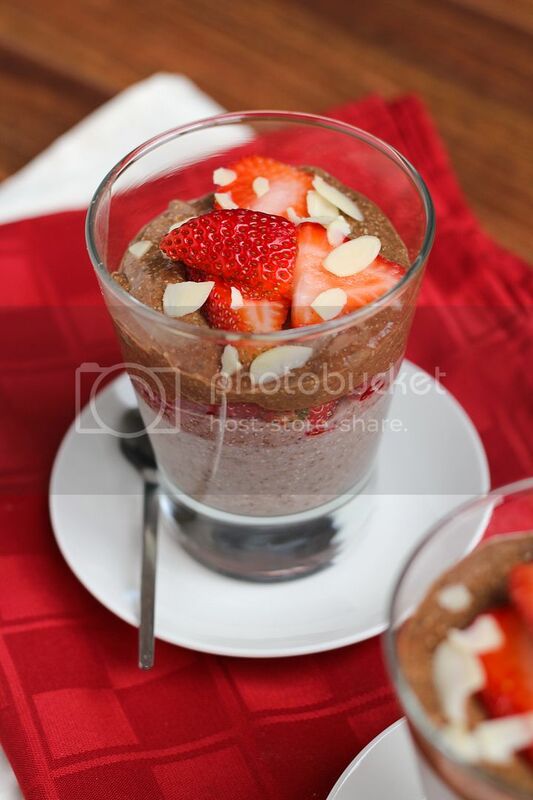 To prepare chocolate pudding, stir together the almond milk, chia seeds, maple syrup, and cocoa powder, and also store in the fridge along with the strawberry pudding. When ready, the mixtures should have a more gel-like consistency. If you like you can serve the pudding as is, but if you want a smoother consistency where you won’t notice the chia seeds as much, transfer each mixture to the blender separately (cleaning in between) and puree until smooth. 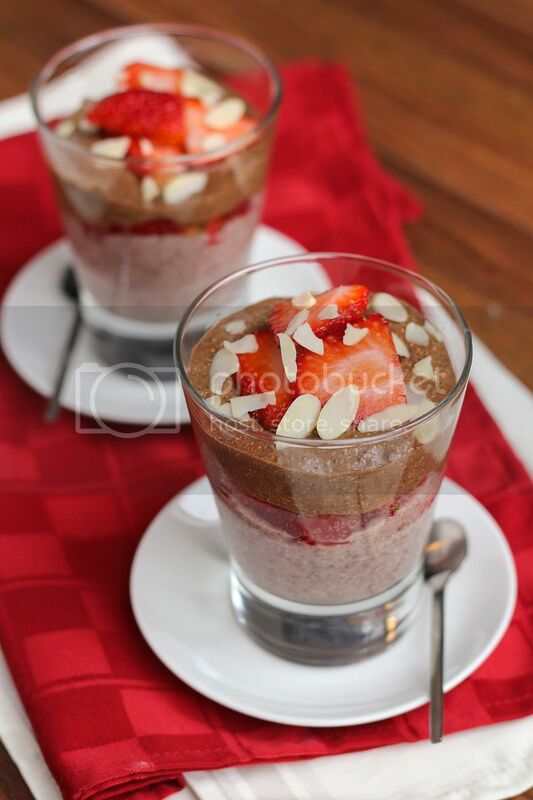 To prepare pudding, layer chocolate and strawberry puddings in glasses or bowls with sliced strawberries and almonds in between each layer and on top. If you like you could also top with chocolate chips and/or coconut flakes and an extra drizzle of maple syrup or honey of it’s not sweet enough for your tastes.